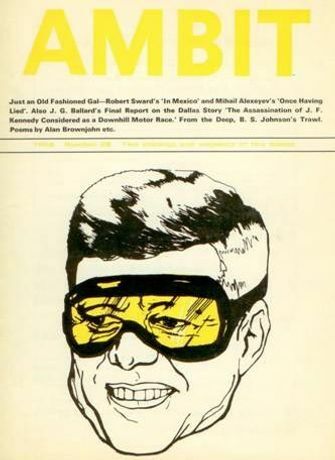 AMBIT COVERS is a groundbreaking exhibition  displaying 50 of AMBIT magazine's most iconic covers. This exhibition is a rare opportunity to see works by some of this century's leading artists and illustrators, at the pivotal point in their career - just as they emerged on to London's art scene. See works by artists - David Hockney Ralph Steadman Edward Paolozzi Mike Foreman Peter Blake Ron Sandford Posy Simmons Chris Pig Since 1959, AMBIT Magazine has fused visual art and literature, and has been a must on the magazine racks of the UK's major galleries and museums. Inside the magazine - poetry, art and short stories combine to earn AMBIT the reputation of a modern classic, and the covers have themselves become nothing short of iconic, pieces of time bound artworks. Dr Martin Bax has been Ambitâs editor since its conception and Mike Foreman has been art editor since 1962. Join us on the Wednesday 17th November 2010 from 7 to 9pm at the Original Gallery, Hornsey Library, N8 9JA for the exhibition's private view. Meet AMBIT staff, artists, poets and supporters; buy prints of the covers and editions of AMBIT from which the prints were taken; and hear poetry readings by four poets, some inspired by the AMBIT covers on display. RSVP to James Townend james.townend@haringey.gov.uk by Friday 12th November. The Original Gallery is a beautiful, light drenched room situated in the creative hub of Haringey. The gallery aims to exhibit and sell great works of art from emerging, and established artists. Join our mailing list to be the first to hear about up and coming talks, films and workshops. The gallery is open from 1 to 7pm Monday to Friday and from noon to 4pm Saturday and Sunday. Entry is free and all works are for sale. Visit www.haringey.gov.uk/theoriginalgallery for more information.